Despite all of this time spent in one of my favorite states, I had the opportunity to return just one month later in order to take care of a few loose ends related to my research projects at work. On this research trip, I had two primary objectives. 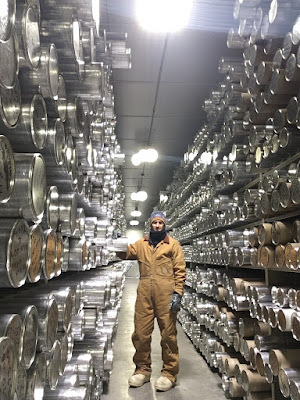 For the first objective, I had to make a quick visit to the National Ice Core Facility outside of Denver in order to cut 53 separate samples of ice from the recent South Pole Ice core. After cutting these samples, I would ship back to my lab for analyses. 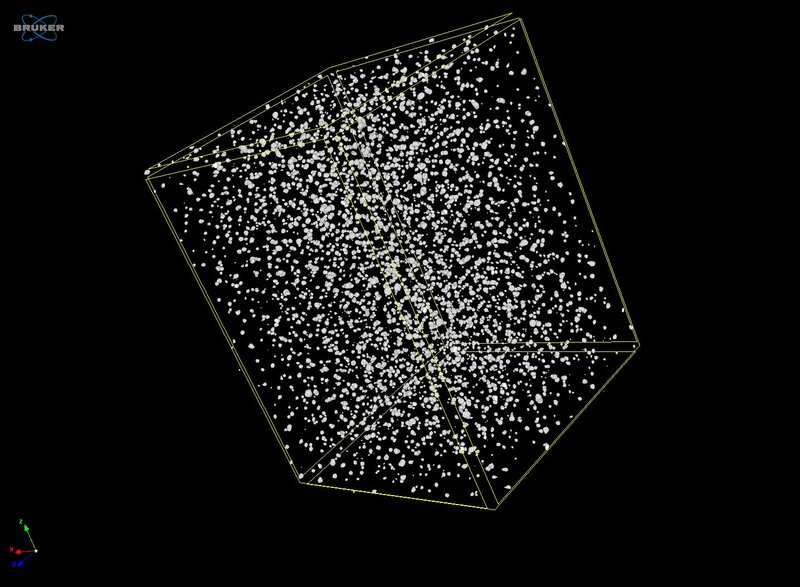 There is an instrument at my lab called a micro-CT, which can measure the internal structure and properties of various materials. A micro-CT is actually an instrument designed for hospitals in order to scan bone and tissue through the use of high-energy x-rays. 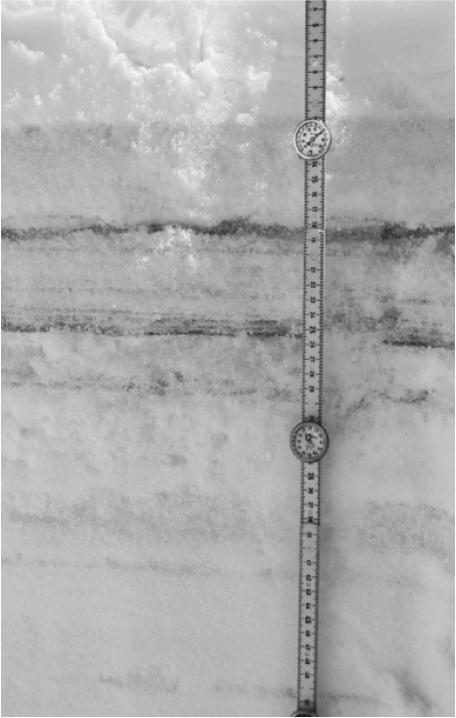 Our scanner is this same kind scanner...only we keep it in a freezer, and use it to measure the internals structure ice and snow. 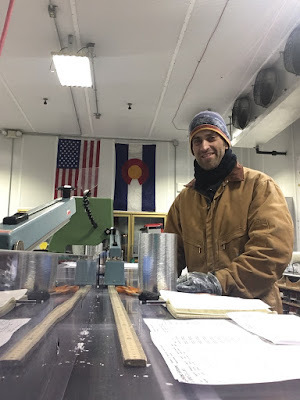 I spent two full days at the Ice Core Facility outside of Denver, working very long hours to pull all 53 ice cores from the archives, and then cut/prep each of my small samples. The dimensions of each sample I prepared were approximately 2cm x 2cm x 8cm...or very roughly about the size of a roll of pennies (only with square edges). After cutting each sample, I then had to carefully pack them all, and ship them back to my lab in special cold containers. This was a lot of work to cram into just two days, but I managed to get it all done thanks to very long hours, and only slightly frost-bitten fingers. 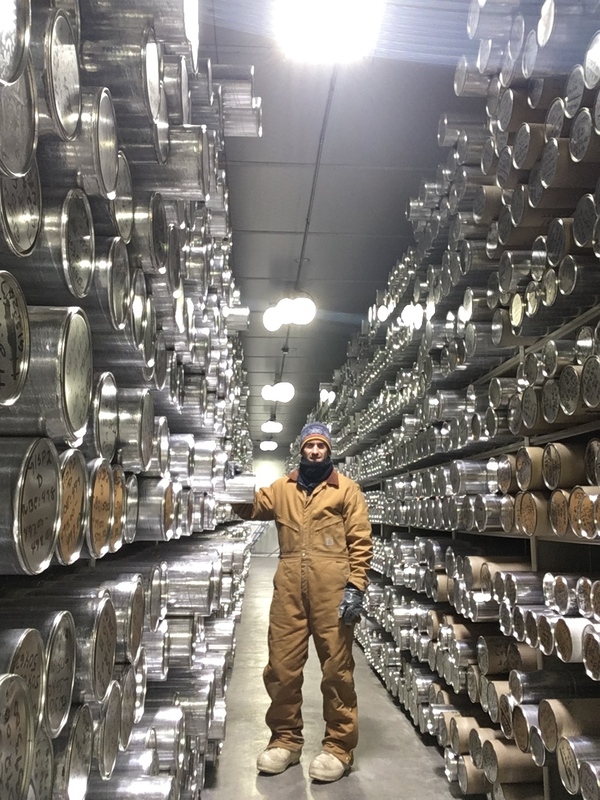 In the Ice Core archives pulling my 53 tubes. 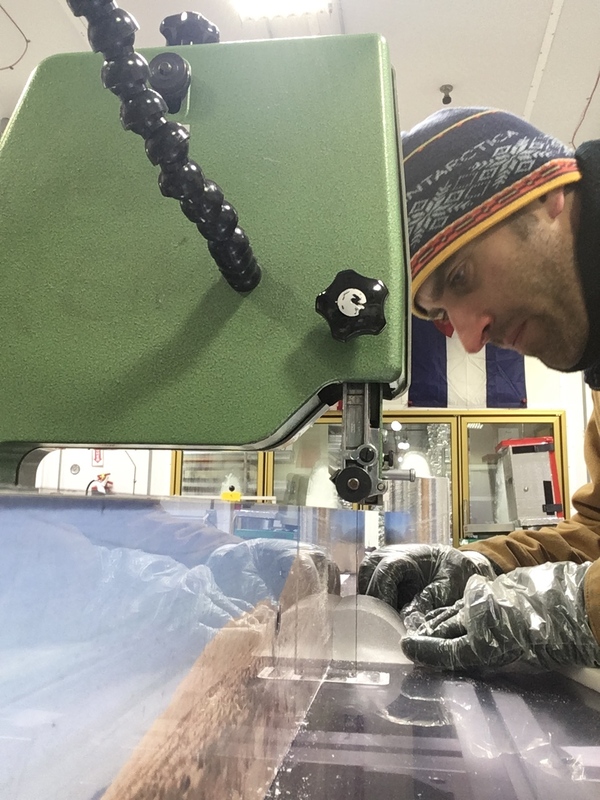 Cutting my "sticks" of ice off of the larger archive piece. The second objective of this trip to Colorado was to collect a series of soil samples related to a dust-transport project. Recently, large dust episodes have been observed within the snowpack in and around the San Juans of Colorado. These dust events have been increasing in frequency in recent years and are starting to have a measurable effect on the snowpack and how fast it melts. 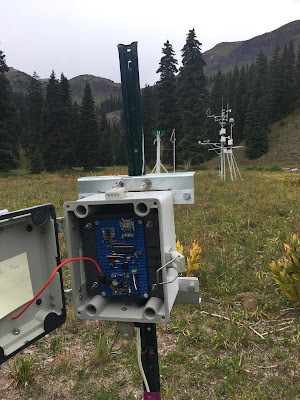 The overarching purpose of the project being carried out at my lab (which is all under the greater umbrella of the NASA SnowEx project, is to try to better pin down the provenance, or source, of the dust. 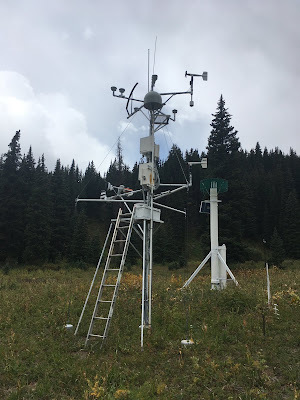 One way we can do that is to first go back and look at relevant meteorological data from various weather stations in the area. Using those data, we can run trajectory models based on the days the dust appeared, to model where it was most likely to have originated from. Then, identify and select physical sites in those projected areas for sample collection. 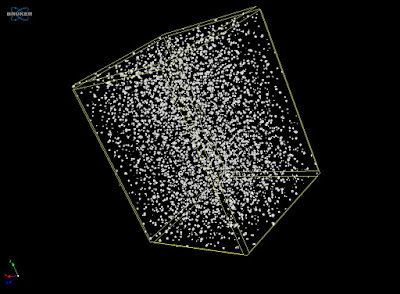 It turns out that almost all "dust", has a very unique microbiological signature. Quite simply, different families of micro-organisms grow in different patches of dirt. 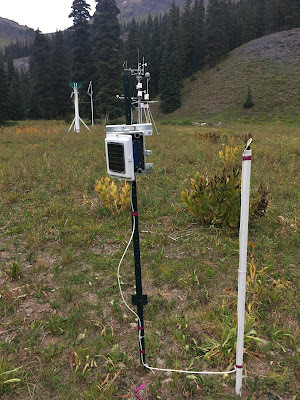 So, once we collected our various samples, we can run DNA sequencing on the various micro-organisms in those samples, and compare the results to the actual dust we sampled from the snowpack. Then, if we find a match, we can go back and compare it to what the trajectory model predicted to see if it was accurate. Ultimately we are trying to determine if the increase in dust events is due to environmental changes in the source region of that dust. 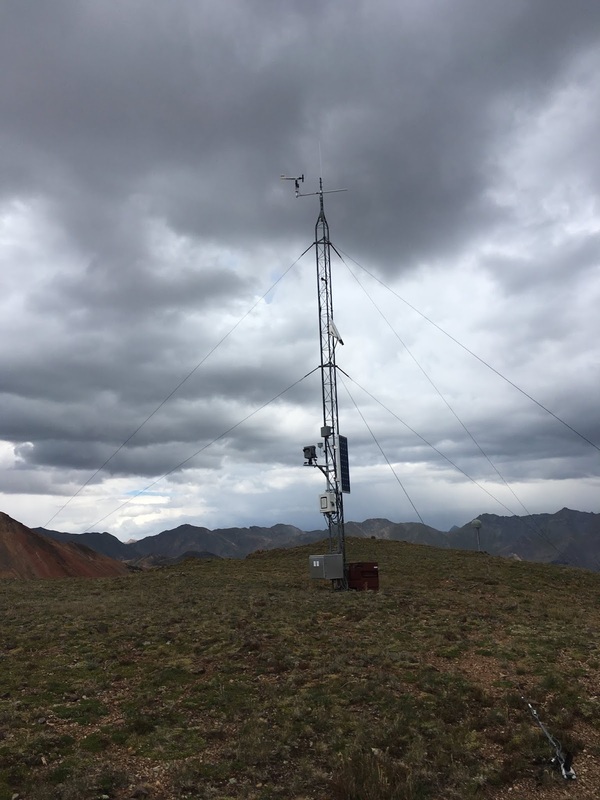 For example, is a dry/dusty area near the San Juan Mountains...getting dryer and dustier? And if so, why? I pulled up satellite imagery for Southwest Colorado, and created a candidate source map for collection based on apparent "dusty" areas, as well as where public land was available. 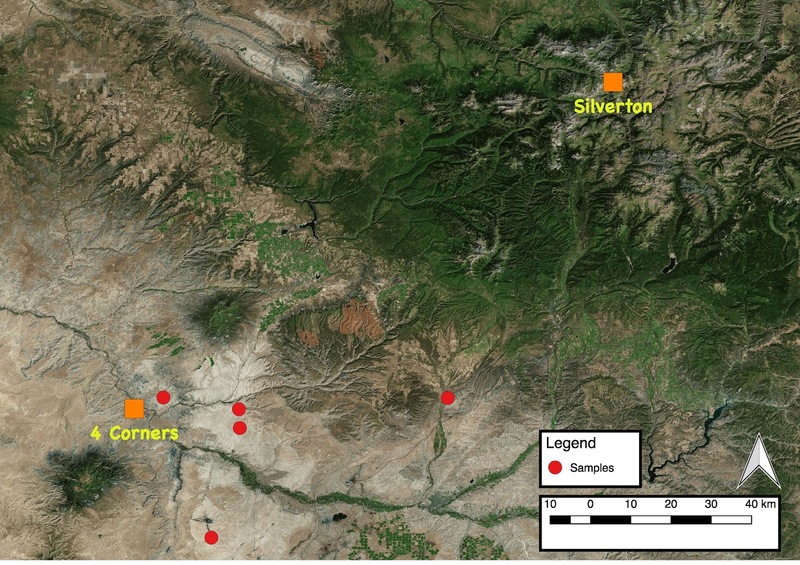 Much of the land in that part of the 4-corners region is also on Indian Reservation land, so also requires written permission for sample collection. Dusty/dry sampling area near the iconic "Shiprock"
Once back in Silverton, I had one more official task to complete before I could sneak away for some play time. 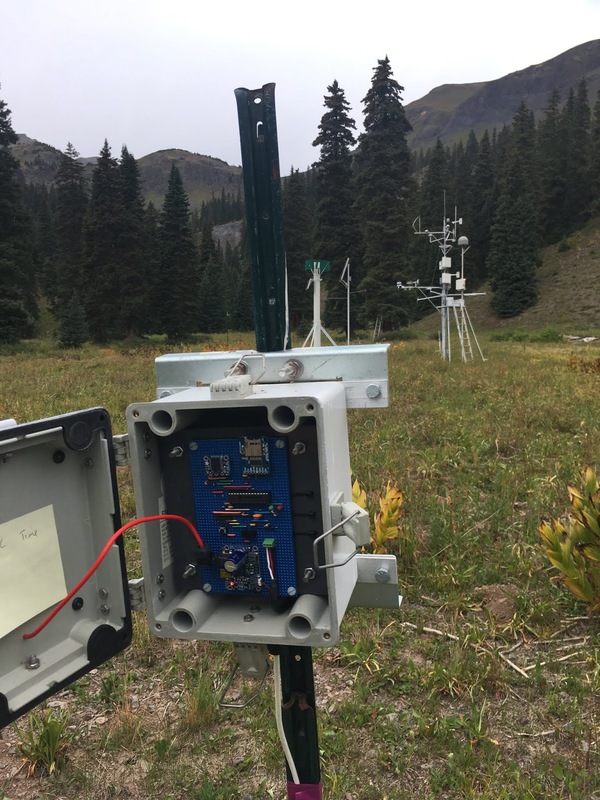 Three of the weather stations we used for meteorological data collection related to the dust project are located near Red Mountain Pass. I was tasked with hiking in to these stations in order to perform some basic maintenance on them. One of the stations was right up from the highway, but the other two required significant off=trail hiking. I had an absolute blast free hiking with just my GPS to guide me. I managed to locate all stations without any trouble, and was able to service them all before the nasty weather came in. I also took some additional soil samples at the base of each station. Track showing hike up to stations 1 and 2. Station #1 - "Swamp Angel"
Hike up to Station 3, "Putney"
Back in July during my vacation and Hardrock preparation, I managed to knock out several more 14ers in my quest to summit all 58. Prior to this second trip, I had 11 remaining peaks to bag before I could declare my quest completed. One of my last climbs I had a rather unpleasant scare in the Chicago Basin as I took a nasty fall on my descent from Sunlight Peak. It spooked me quite a bit and I wasn't sure when I'd be comfortable attempting my next climb. 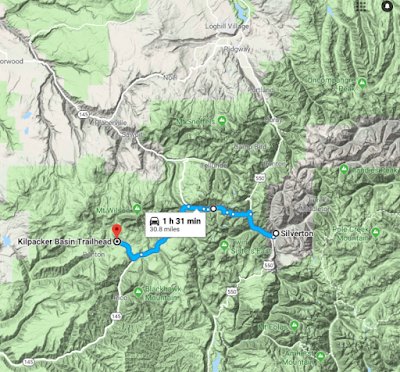 I spent quite a bit of time debating whether or not to attempt another hike on this trip, and ultimately decided I'd at least start at a trail head to see how I felt. If I wasn't ready, I would simply turn around. Of the 11 peaks still to summit on my 14er list, 7 are in the Elk Range. I wasn't anywhere near that range so those were out of the question. 2 other peaks are over in the Crestone range in the Sangre de Cristos; also really far out of the way. The last 2 though, were in the San Juans. These were also the only two that I still had to do in that grouping. These two peaks were Mt. Wilson, and El Diente. 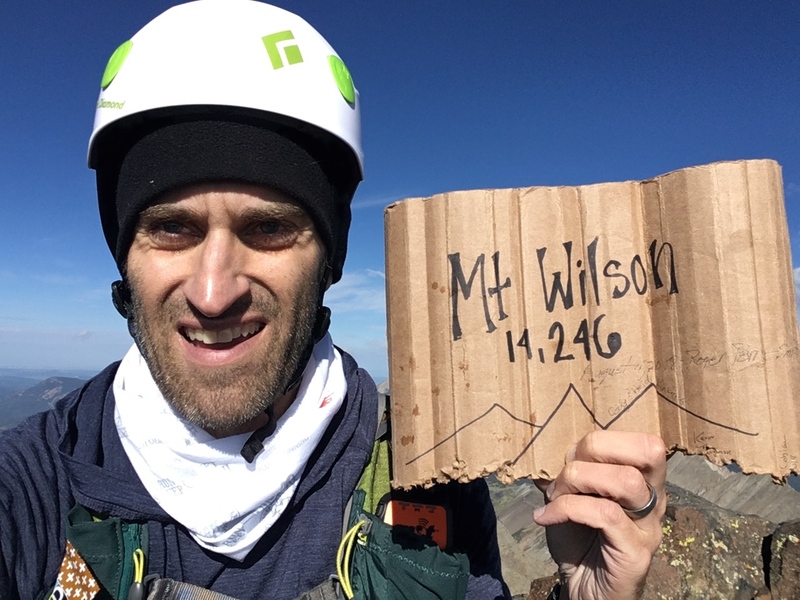 I had previously done the nearby Wilson Peak, back in 2017, but never did get these other two done. With time to kill on this trip, and the proximity to the peaks, I decided to head to the Kilpacker trailhead and give it a whirl. If successful, I could finish out the San Juan 14ers completely. 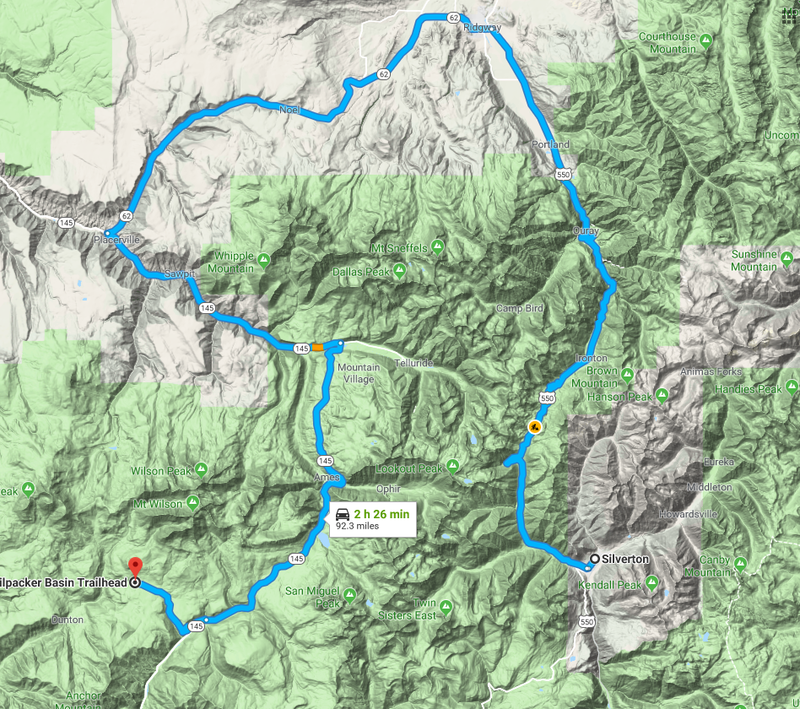 To save time, I had this grand plan of driving up and over Ophir pass in my rental SUV, rather than driving all the way around via Ouray, Ridgway, and Placerville. I had driven up to the pass the previous evening to scope it out, and had no trouble, so figured going down the other side wouldn't be a big deal. I googled a bit about it and it seemed like the general consensus was that it wasn't too bad. I figured even if it was slow, it would still be way faster than driving all the way around. Well...I was in for a really big shock the next morning when I started descending from the pass in the wee hours of the morning. Thankfully my little rental SUV had moderate clearance because there is no way I would have ever made the descent in a car. The descent was terrifying and extremely narrow and loose. I honestly feared that I was going to careen off of the mountain side. It was absolutely nerve wracking and I descended very gingerly, holding the steering wheel with a death grip the entire time. I thought for sure, even if I did make the descent, that I would most certainly damage the undercarriage of the car or get a flat tire. Somehow though, I managed to navigate all of the tricky spots good enough to make it through. I definitely bottomed out several times though and only hope that the rental company never figured it out. For anyone reading this, please take notice. 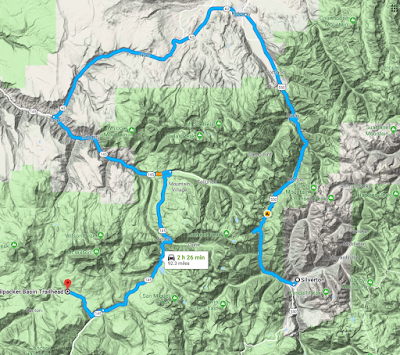 The Ophir pass road is really only suited for high-clearance 4x4's. Anything less, and you are in for some stressful miles without any real options for turning around. Here's a video of someone driving UP the bad side of Ophir Pass that I went down. Once down on the other side I was over to the Kilpacker trailhead in under 30 minutes. I started my hike at about 5:30 am and was making quick work of the easier trail section down low. In just over an hour, I had already made it past 3 miles and was beginning the more technical climbing above tree line. I was still fine to continue, so happily pushed on. At 2 hours exactly, I made it into the upper basin and the primary decision point turn off. At this spot the trail splits, with one trail going up to Mt. Wilson, and the other turning left and going up to El Diente. It's possible to go up to either and then traverse across the ridgeline to the other, but I was not going to attempt this class 5 maneuver. If I were going to do both summits, it would mean summiting one, and then dropping back down to the junction, and summiting the second peak separately. I opted to shoot for Mt. Wilson first as it was the longer climb, and higher summit. I figured if I had to come back and just do El Diente on a different day, then it would be quicker overall. The climb up after the junction began to get very loose and scrambly. My pace reduced notably, but I was still feeling great and was not spooked at all. I could tell I was moving very slowly, but pushed on. My goal was to summit in under 3 hours. The last pitch is the crux of the route, and does have some exposure. I took it very slowly and had no trouble. At this point I just had one final short pitch to the summit, so continued up. I hit the top in just under 3 hours and felt great. The actual summit was quite small and was fairly exposed. I took a few quick pictures of the El Diente traverse as well as views over to Gladstone and Wilson Peaks, before quickly descending back down. I purposely descended a bit slower than usual because I was still a little shaken from my fall coming down Sunlight the previous month. After about 10 minutes of descent, I looked up towards El Diente and realized that if I started contouring around, I could meet the El Diente trail part-way up, and would save myself several hundred feet of descent/climb. 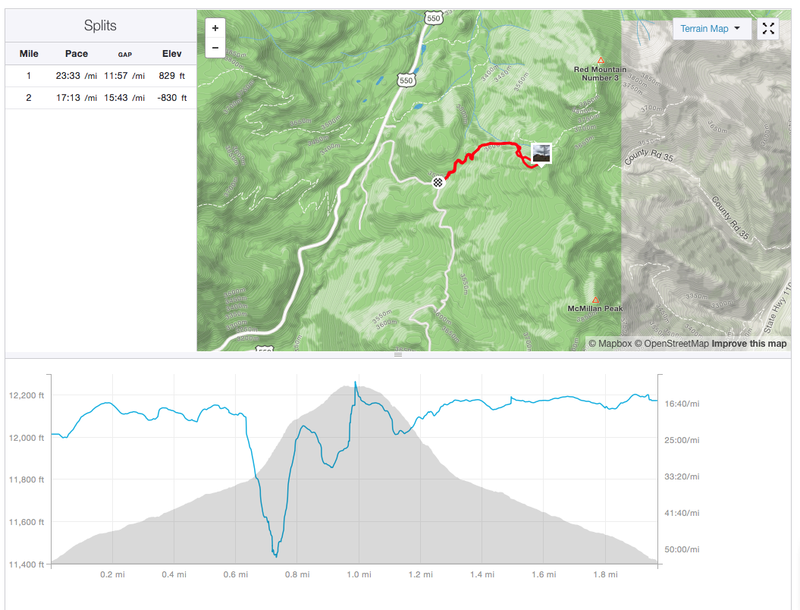 I peeled off of the route I was on and began to contour over on an open off-trail route. It was slow going, but effective. at 3hrs 15minutes clock time, I was already over to the El Diente trail. I figured from here, it would be a super quick up and down, and I'd be back to the car in no time. But...things never work out just the way you want in the mountains. My pace was slowing considerably, and the weather was starting to turn. I was only a few hundred feet below the summit, but didn't want to turn back. I kept pushing up to the ridgeline, and just before topping out, it started sleeting. I was only a few minutes from the summit, but the rocks were getting extremely slippery. I took a long look at the sky and opted to just quickly go for it. I hustled over to the summit in the freezing rain, tagged it quickly, took a couple photos, and immediately began descending. I was slipping on a lot on the rocks, but was making progress. I made it down from the ridge line and began spotting cairns for the trail. I hit the main trail junction in just under 4 hours total time, and felt relieved to be nearly back on soft trail. I just had to hike about a mile on rocky exposed trail before hitting treeline, so figured I was in the clear. I sauntered along without a care, when about 5 minutes later I was greeted with a sky crushing boom of thunder and lightning. It was close! I quite literally began running as fast as I could along the trail, just praying to make it to treeline in time. I didn't even stop to put on my rain gear. I just ran. The lightning was getting closer, and what's worse, was that I wasn't alone on the trail. I passed a few others also trying to descend. Everyone was running scared. I did make it to tree line safely, albeit with soaked clothes. By the time I was deep into the woods at lower altitude, the rains had stopped and the thunder and lightning seemed to be isolated near the peaks. Looks like I would live to hike another day. The trail down low had turned into a river so when I did make it back to my car, I was caked in mud up to my knees. 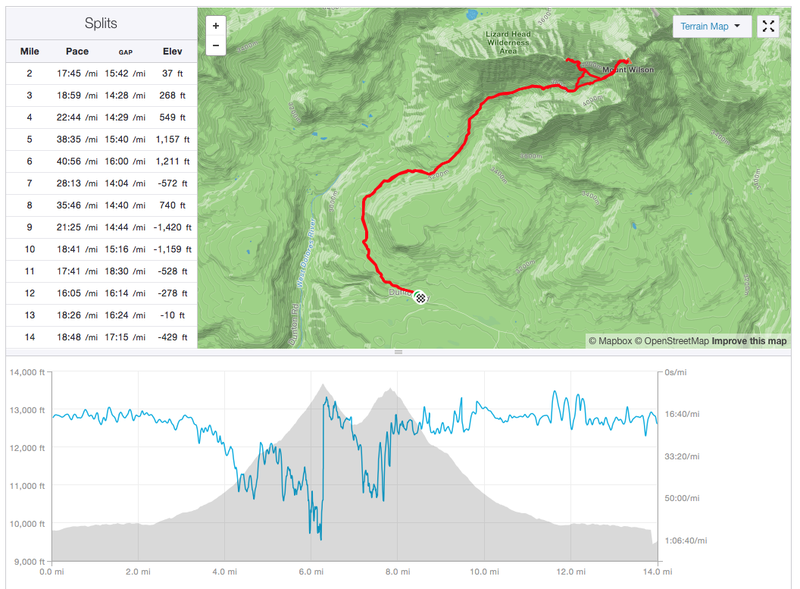 Somehow, my car still had four full tires as well, so my little adventure over Ophir pass didn't seem to damage anything. I called it a successful, although lucky, day. 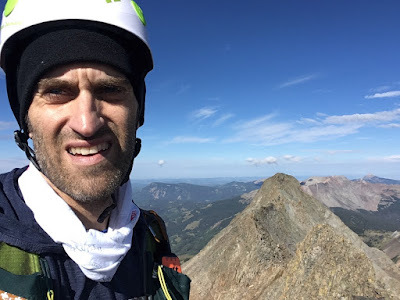 With this little adventure, I was able to complete the San Juan 14ers, leaving me with just 9 peaks remaining: The Elks, and the two primary Crestone Peaks. 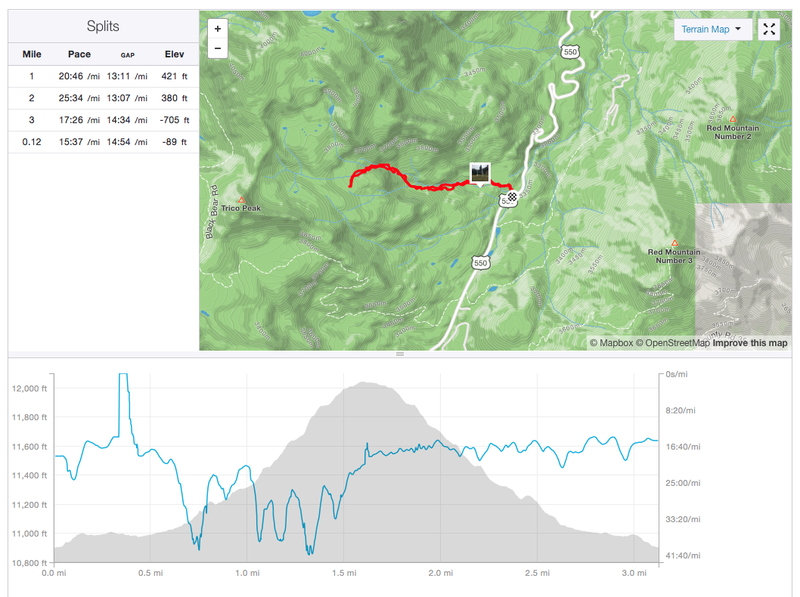 Route showing my full hike. After my fun hike, I drove down to Durango so that I could catch my flight out the following day. While there I had the incredible good fortune to catch up with some very old friends. 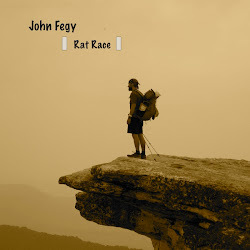 Back in 2007 during my Appalachian Trail thru-hike, I met and hiked with quite a few people. With that said though, there weren't too many that I stayed in contact with following the hike. 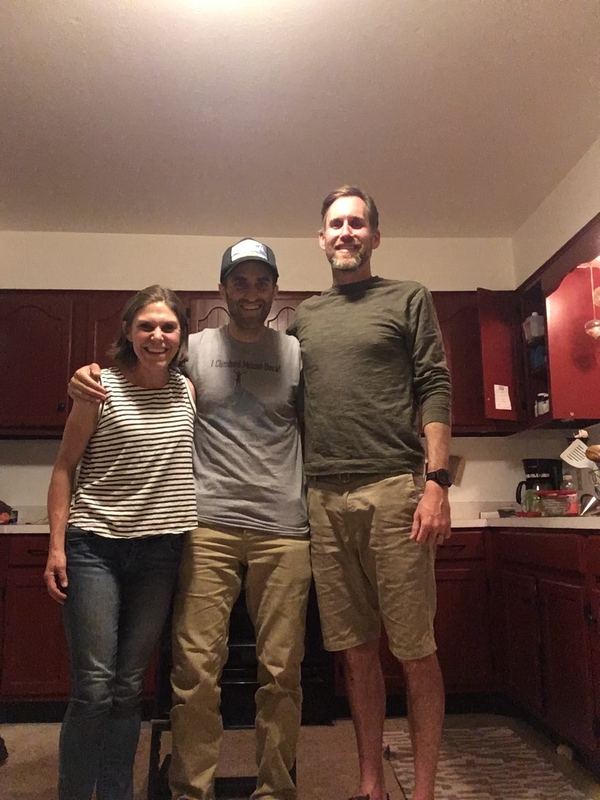 There was one couple I met on my third night just before hitting the North Carolina border with trailnames: Stitch and Figgy. Apparently Stitch liked to sew his own hiking gear, and Figgy really liked figs. I remember really hitting it off with these two, but the next morning I hiked on ahead, and never saw them again. Months after finishing my thru-hike, Stitch found me on-line and reached out. We've been internet corresponding on and off ever since. They live in Durango now with their three kids, and in July, during my running at Hardrock, they had both driven up to Silverton hoping to see my finish. I was not aware of this and only found out because they had left me a note on the public message board. Ultimately, they had to leave before my finish, but I did manage to write their phone number down just in case I was ever in the area again. Well....after my Wilson/El Diente hike, I was headed for Durango. I sent a quick text to Stitch, and just like that I was at their house just a short bit later, enjoying some great company and stories. One of the things I love about thru-hiking, is that you can spend an evening talking with friends that you met on your third day of hiking....that you haven’t seen in 11 years....and it feels like you just saw them yesterday. Thanks John. Those are some beautiful pictures.